Manor College Student Senate and the Dean of Student’s Office are proud to offer the “Bird Feed”, a food pantry available to students, staff, and faculty. 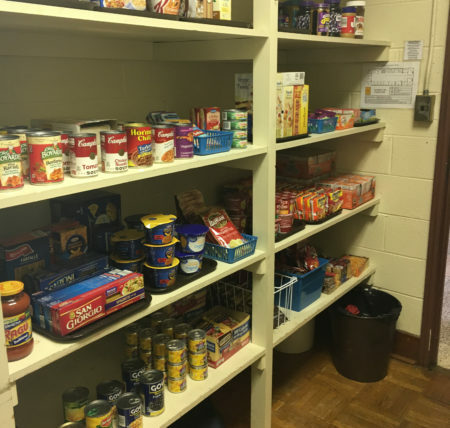 The Bird Feed is designed to meet the immediate food needs of its students on campus by providing a variety of non-perishable food items and basic necessities to students and their families. The pantry is located in Mother of Perpetual Help Hall on the second floor across from the campus Chapel. If you have an immediate need during a time when the pantry is closed, please contact Public Safety and they can provide access to the room. Donations are gratefully accepted! There is a collection bin outside of the Bird Feed for non-perishable items. We will gladly accept gift certificates to food stores (preferably Giant) as well. Monetary donations are also encouraged. Click the link below and select “Bird Feed (Food Pantry)” as your Designation. If you would like more information on the Bird Feed or have any questions, please contact Allison Mootz, Dean of Students, at amootz@manor.edu or 215-885-2360 x276.